This healthy spin on traditional Italian lasagna is loaded with veggies and bursting with flavor! This casserole is low in artery clogging saturated fat unlike classic lasagnas made with fatty meats and mounds of cheese. In a large saucepan, bring the water to a boil. Add ½ teaspoon kosher salt. Slowly pour in the cornmeal, whisking continuously. Bring the mixture a boil, then immediately reduce the heat to low so that the mixture is just barely simmering. Cook, whisking or stirring every few minutes, until the polenta is thick but still spreadable, about 20 minutes. While the polenta is cooking, liberally coat a grill pan (or large sauté pan) with oil spray and preheat the pan over medium-high heat. Working in batches, grill the zucchini and eggplant slices for about 4 minutes per side, or until softened and charred. Sprinkle both sides of the veggies lightly with ¼ teaspoon salt and black pepper as they cook. Reapply oil spray to the grill pan or veggies as necessary to prevent them from sticking. Set aside. Coat a medium casserole dish (about 2½ quarts) with oil spray. Spread half of the marinara sauce on the bottom of the dish. Pour in half of the polenta and try your best to spread in an even layer. 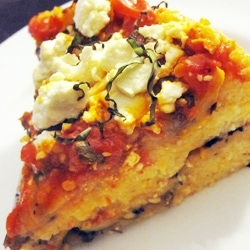 Layer in half of the grilled vegetables, then top with the remaining polenta. Layer on the remaining vegetables and pour the rest of the marinara sauce over the top. Sprinkle the goat cheese on top. Cover the dish with aluminum foil and bake for 30 minutes. Remove the foil and bake for another 10 minutes. Remove from the oven, sprinkle with chopped fresh basil if desired, and allow to cool for 5 to 10 minutes before slicing and serving.